(SPOT.ph) It was a wait well worth it. Just a few hours before his fan conference at the SM MOA Arena, Zac Efron met with a few members of the press for a round-table interview-after a nap in his hotel suite, we learned. The man showed up all smiles, asking for everyone’s names, shaking hands and saying "Hi, I’m Zac!" as if we didn’t know already. He was a man of few words and several gestures, occasionally slamming his hand on the table when he made his point, tipping his chair backwards in a way that would have made anyone else look like a naughty child. There was an occasional catch in his voice that reminded us how jetlagged this guy must be-after all, he only arrived in Manila a couple of days ago. When asked if he was going to sing and dance at the fan con ala Troy Bolton or Link Larkin, he managed to smile and say "only in the movies, guys." He looked like he was having the time of his life here in Manila and we were there to join in. If you missed the fan con, or just want to learn more about his trip to the Philippines, here’s more of Zac Efron. More often than not, I think that what I’m doing with my career right now is different than what was anticipated. I wouldn’t call it a misconception, I just enjoy surprising people and not necessarily what was expected. I think that it all comes with the time. I’ve worked on different projects with some very talented directors and I’m very blessed, I think, to have that opportunity. Several directors have sort of taken me under their wing to guide me and really show me a lot of new facets of acting and new ways to go about it. They present me with different roles that are going to be more challenging to the audience. It’s one of things you don’t know until you see. It could be just about anything. I think I have to be in front of her to see it. I’ve always wanted to come out to the Philippines. I was thrilled that a brand like Penshoppe had an opportunity like this and that they wanted me to do it. I was ecstatic, not only because the brand itself is very cool, but they gave me a chance to go to the Philippines, which I’ve always wanted to do. When I was young, my dad used to come out here a lot. He was the adventurous type, and I really admired him for going and experiencing different cultures and seeing the world specifically the Philippines. I always wanted to come out here and when Penshoppe said that I could do it, I was thrilled, I couldn’t believe it. It’s a dream come true. I would love to do it! It all comes down to the people involved with the project, the director and the role. But if there was a way for me to really immerse myself in a role, whether it was action or something else, I would definitely look into it. Everybody knows the rules. I think 90% of it is really what you put in the body, it’s what you eat. If there’s one thing that I make sure I take care of, it’s my diet. Eat a lot of vegetables, try and stay away from fast food. I don’t really drink soda, I think soda’s a bad thing and stuff like that. All the things you already know. 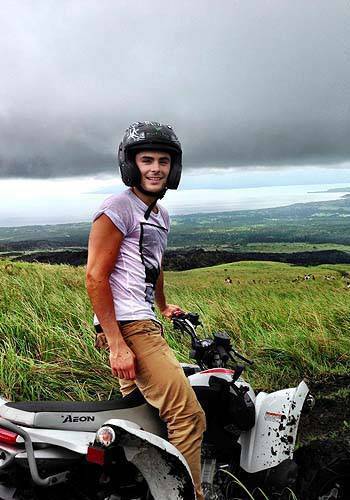 This photo of Zefron at Mayon Volcano was posted on his FB page just this weekend! My most memorable experience in the Philippines so far was a total surprise. I was hiking up Mayon Volcano, that’s how you say it, right, Ma-yon? And all of the sudden there were these ten ATVs halfway up the trail. I was like, "Oh my gosh!" And they said "Yeah, we’re going to ride these up the mountain." So we got on these ATVs, me and my dad-all of us, the whole Penshoppe group got on ATVs. We rode them up the lava fields to the top of the volcano for one of the most incredible views I’ve ever seen in my entire life. It was one of the funnest things I’ve done in my entire life, and not even just the trip. I was blown away, so it was pretty cool. I don’t know exactly what my dream movie role would be yet. I think every movie that I’m about to do becomes my dream part. I would like to do everything, so it’s hard to pick just one. I really enjoy working with my elders and more experienced actors. All the people you think, I’d really like to work with. I would like to work with Johnny Depp, Leo DiCaprio...I’m in my dream cast right now, I worked on a movie with Nicole Kidman, Matthew McConaughey, John Cusack, Macy Gray. 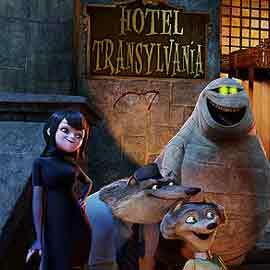 That was a dream cast. That was one of the most incredible experiences of my life. If I travel, I like to bring one suit for premieres or nice dinners. I wear a lot of T-shirts, jeans. A leather jacket! It’s a journey and a natural progression. I don’t think you can really help it. As I continue to work and grow up my aspirations evolve and I always have enjoyed work that’s challenged me and forced me to grow, the kind of things that scare me at first. I’m always looking for roles that challenge me and force me to grow in my acting. 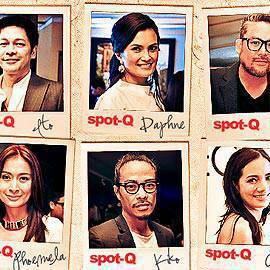 SPOT-Q at the Launch of <em>Elle Decor</em>: What is the most essential piece in the home?